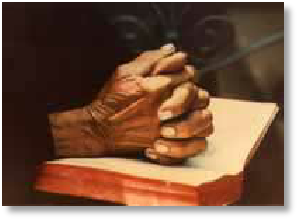 The Prayer Chain: A group of intercessors offering prayer in times of emergency or stress. Prayers are said for one week, or longer if requested. Full confidentiality is maintained with details confined to the chain group. Other intercessors pray for those with chronic or longer term problems on an ongoing prayer list for as long as needed. Personal prayer and laying-on of hands for wholeness and healing is offered during the 10.45am service at All Saints on the 3rd Sunday of each month and during Evening Prayer once a month - usually on the 4th Sunday. Prayer Oasis: A quiet, meditative hour listening to God and taking time out of our busy lives to concentrate totally on Him; it is based on the teachings of Julian of Norwich. This is held at 7.30pm on the 3rd Tuesday of each month at a member’s home and people from other churches are very welcome to attend. Prayers for the World are offered on alternate Friday mornings in All Saints at 10.30. The service provides approximately one hour of open prayer using maps and candles. Prayer and Praise services are held from time to time at All Saints'. A lively but moving modern service, usually led by lay people. The Great Prayer Experiment is a monthly opportunity to pray in a different way. Both workshops and prayer pack are available for adults, youth and children. Look out for details in the pew sheet and around the churches. For more information, or to activate a prayer chain request, please contact the prayer co-ordinator, Jill Walley, on 01609 776625.